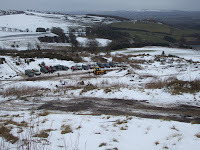 We had about 25 vehicles out today, sunday. Conditions were very tough in the wet heavy snow but everyone had fun and we had lots of smiling faces. March starts tomorrow, spring is coming! So maybe the snow will disappear? More snow on the site again today but not serious enough to affect our training or vouchers, but it did drift badly across the access road again! The Ambulance Service have started training on site again and we are this week putting in a few new tracks as well as clearing access to areas that have become unusable. 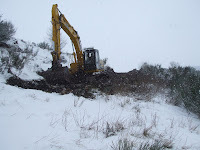 Pic shows Andrew Swan from next door making a new track in the north west corner of the 4x4 hill. We have also clared and levelled an area for Clay Shooting in the south west corner, and please do not drive over this area as we are preparing it for grass seed. We have also put in a few telegraph posts as anchor points for self recovery and winching in selected spots on the hill. 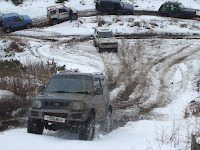 Finally Tay 4x4 Club are coming to play this sunday 28th feb, thats it. See you all soon, Walter.